Le Mourillon is one of the districts of the harbor city of Toulon. Jean-Marc on the Corniche by the beach with Diva Maggie McMiggins (pondering the injustice of no-dogs-allowed-on-the-beach signs -- unlike the folks in the 1999 photo, we did not break the law. Randy with Diva. Even though it was around 9:30 a.m., the sun was very strong. The Fort Saint-Louis behind, and the café La Reserve to the right. 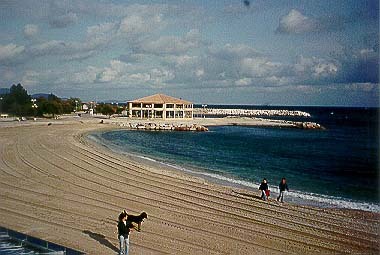 The beaches of Le Mourillon; across the Bay, the peninsula of Saint-Mandrier with its French naval base. 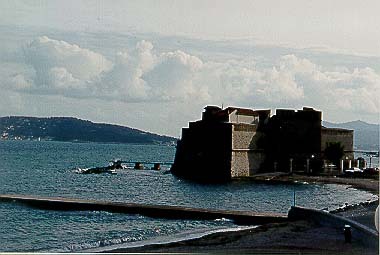 The Fort Saint-Louis, next to the Corniche. We have breakfast at a café facing the beach and the old Fort Saint-Louis (now a yacht club), one block from my inlaws' former apartment. Our breakfast café La Reserve facing the beach has changed owners since 1999, but is still open.